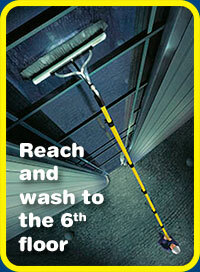 Jacob’s Ladder provide Window Cleaning Services in Glasgow. Call us on 07855 587 286. Fast, efficient and fully insured, Jacob’s Ladder offer a first class window cleaning service for your business or home. Our reach and wash system means we can clean up to the 6th floor without the use of ladders, ensuring maximum privacy for our customers. We clean using ultra pure H2O, giving a streak-free finish without the use of harmful detergents. Call us today on 07855 587 286 and put us to the test.